Chapman – A name that gives no indication that this is a drink. A name that may have in times past referred to an itinerant peddler. Chapman. A drink. Of Nigeria, for Nigeria and by Nigeria. The definitive Nigerian drink, loved by all. Though its origins are unclear, it is beloved across the country – North, South, East and West. I’ve always known Chapman and never had it in any other country. I remember my friends in the UK being delighted and surprised when I made it for them a few years ago. 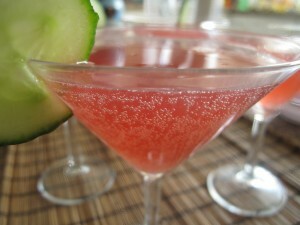 This citrusy (non) alcoholic cocktail has accompanied many a dinner date with teenagers and adults alike. When I was young, it was the in-thing. And boy, did we enjoy it! For many years, I completely forgot it existed. Those were my years at University in Liverpool when I was busy exploring other delights like Cider. It wasn’t till I went home one summer and had it again that my head spun and determinedly, I took the recipe back to the UK, secret ingredient and all. Now while I won’t call it a Tropical drink, sensu stricto, it has the look and feel of warm climes, of ice and citrus scents and flavours. It is made of A mix of soda, citrus, cordial and bitters. Yes, bitters. The secret sauce. The special ingredient of Angostura Aromatic Bitters. 45% alcohol but only a few drops are required. And the transformation, the uplifting is complete. Ready to serve. Although Bitters have a high alcohol content, they generally consist of gentian, aromatic herbs and spices, probably preserved in alcohol. This bitters give this drink its characteristic and unique flavour. Of course, you can still make it without bitters….but….it is best with. My funniest memory of Chapman was a few years ago – 2003 to be exact. We were at a wedding with my sister and her family. Of course Chapman was served, in copious quantities. My niece took a liking to the somewhat red colour and kept drinking from the mugs we were being served. The more she drank, the more active she became: dancing and displaying her talents at 2 years old. And then, amazed at her energy levels, someone figured out that perhaps there was something in the drink which was causing this……and there was : Campari. That put a quick stop to her self-watering. Thankfully, there were no adverse effects. In Nigeria, Chapman is almost always served in a beer mug. I have made it in so many ways: in a punch-bowl for a kids party, in dainty cocktail glasses for grown-ups or just as a refreshing drink at home in a beer mug. Each one calls for its own ‘container’ and none affect the taste whatsoever. Put the about half of the Icecubes in a glass or jug or bowl, saving the rest to serve the drinks. Pour the blackcurrant cordial in. Add the Sprite and Fanta. Then add the bitters, being careful not to add too much. We’re aiming for a smooth balanced finish and not the taste of trees! The next step are the citrus twist – add a squeeze of Lemon, Lime and Orange. Give the mix a good stir and pour into glasses or cups. Top up with the remaining Ice cubes. And garnish. 4. You could easily transform this from non-alcoholic to alcoholic by adding a capful or two (use your discretion) of your favourite spirit. Or add some Campari. 5. You determine your garnishes – mint, cucumbers, citrus slices. I’ve read of people loving bananas in it. Personally, I’m a cucumber babe but you just might be a Pineapple kinda guy, who knows. Go with the flow and do rock the boat i f you must. Expand your horizons and mine. Whatever you decide, please make this and share your favourite combos with me. Teakisi (formerly ElleAfrique) is an English and French blogzine dedicated to challenging and changing the perceptions of African girls and women in the world today. Ama on Who’s The Fairest Of Them All? Ayandola Ayanleke on Should creativity be influenced by one’s faith?